Louisiana’s Department of Health and Hospitals (LDHH) have confirmed 53 new human cases of the West Nile infections, marking 145 reported cases and 9 deaths so far this year. At least 31 of the new cases are neuroinvasive disease, which infects the spinal cord and brain and can lead to death, LDHH reported. United States is in the midst of “one of the largest West Nile outbreaks ever seen,” said Dr. Lyle Peterson, director of vector-borne infectious diseases section at CDC. About 1,331 reported cases of the disease have occurred in 38 states including about 640 Neuroinvasive disease cases, leading to at least 46 deaths so far this year. Texas, the worst-hit state, has reported 641 cases with 24 deaths so far this year. Since 1999, more than 30,000 people in the United States have been infected with West Nile virus. Occasionally, a person infected with the mosquito-borne disease may develop more severe symptoms including “West Nile encephalitis,” “West Nile meningitis” or “West Nile meningoencephalitis.” CDC reported. The 1,331 cases thus far in 2012 is the highest number of West Nile virus disease cases reported to CDC through the third week in August since West Nile virus was first detected in the United States in 1999. About 75 percent of the cases have been reported from 5 states (Texas, Mississippi, Louisiana, South Dakota, and Oklahoma) and almost half of all cases have been reported from Texas. About 13,000 of the individuals who have been reported as being infected West Nile virus since 1999 have been seriously ill, and more than 1,200 have died, CDC said. WNV infection causes serious and lasting kidney damage, according to a new report by Baylor College of Medicine. Researchers found that 4 in 10 patients had varying stages of kidney disease caused by WNV infection. About 45,000 people in Houston area have been infected with the virus, many of whom are unaware of it, the report said. One thousand three hundred thirty-one (1,331) human West Nile virus infections have been reported to CDC ArboNET from Alabama, Arizona, Arkansas, California, Colorado, Connecticut, Florida, Georgia, Idaho, Illinois, Indiana, Iowa, Kansas, Kentucky, Louisiana, Maryland, Massachusetts, Michigan, Minnesota, Mississippi, Missouri, Montana, Nebraska, Nevada, New Jersey, New Mexico, New York, North Carolina, North Dakota, Ohio, Oklahoma, Pennsylvania, South Carolina, South Dakota, Tennessee, Texas, Virginia, and Wisconsin. South Korea. Reactor No. 1 at the Ulchin nuclear power plant located in South Korea’s North Kyongsang province stopped operating on Thursday for “unknown reasons,” the Yonhap news agency reported. Fifteen counties in Nebraska have been declared agricultural disaster areas due to damages and losses caused by drought, excessive heat and high winds that began March 1, 2012, and continues, USDA reported. Those disaster areas are (primary disaster areas) Gage, Johnson, Nuckolls, Richardson, Jefferson, Nemaha, Pawnee and Thayer counties; (contiguous disaster areas) Adams, Clay, Fillmore, Lancaster, Otoe, Saline and Webster counties. Nine counties in bordering states of Kansas and Missouri also designated as natural disaster areas because they are contiguous. Kansas: Brown, Doniphan, Jewell, Marshall, Nemaha, Republic and Washington counties. Missouri: Atchison and Holt counties. Drought disaster areas have also been declared in California, Nevada and Utah. 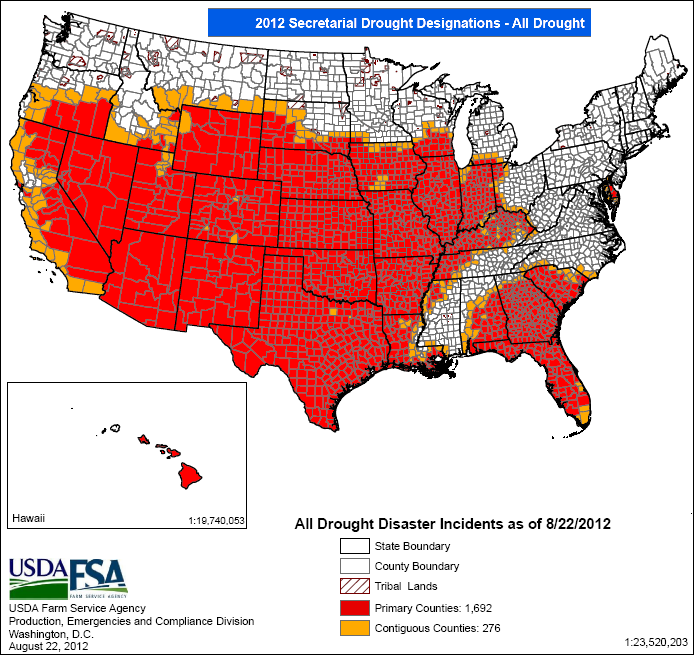 U.S. Drought Disaster Map as of August 22, 2012. California. USDA has also designated 6 counties in California and one in bordering Nevada as natural disaster areas due to damages and losses caused by the ongoing drought. Those counties are Alpine, Amador, Calaveras, El Dorado, Mono and Tuolumne in California, and Douglas County in Nevada. Utah. USDA has designated nine counties in Utah as agricultural disaster areas due to damages and losses caused by the ongoing drought. Those counties are (primary disaster areas) Beaver, Iron and Piute counties; (contiguous disaster areas) Garfield, Millard, Washington, Kane, Sevier and Wayne counties. Idaho. USDA has designated 17 counties in Idaho as natural disaster areas due to damages and losses caused by drought, excessive heat and high winds that began Jan. 1, 2012, and continues. The Idaho disaster designation also includes 9 counties in 4 bordering states. Montana: Beaverhead, Gallatin and Madison counties. Utah: Box Elder, Cache and Rich counties. Wyoming: Lincoln and Teton counties. Kansas. USDA has designated 5 counties in Kansas as agricultural disaster areas due to damages and losses caused by drought, excessive heat, high winds and wildfires that began Jan. 1, 2012, and continues. Those counties are (PDA) Marshall County; and (CDA) Nemaha, Pottawatomie, Riley and Washington counties. Indiana. USDA has designated 5 counties in Indiana as natural disaster areas due to damages and losses caused by the recent drought. Ohio. Darke County in Ohio also designated as natural disaster area because it is contiguous. Georgia. USDA has designated 12 counties in Georgia as natural disaster areas due to damages and losses caused by the recent drought. Tennessee. USDA has designated 13 counties in Tennessee as natural disaster areas due to damages and losses caused by the recent drought. United States. The number of reported West Nile cases nationwide has tripled, with at least 1,118 reported so far this year, Centers for Disease Control and Prevention (CDC) reported. Seventy-five percent of the cases have been reported in five states—Louisiana, Mississippi, Oklahoma, South Dakota and Texas—with more than a half in Texas. “We are in the midst of one of the worst West Nile virus outbreaks ever seen in the U.S.,” Lyle R. Petersen, director of the Vector-Borne Infectious Diseases at CDC, told reporters. 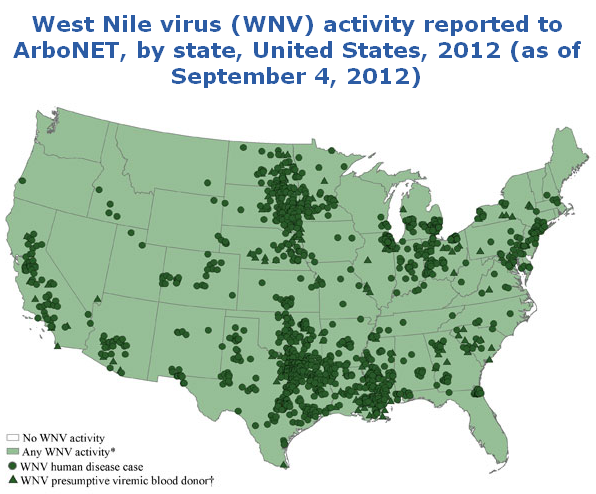 West Nile virus have caused at least 41 fatalities, so far this year. Texas has reported 640 West Nile infections and at least 22 deaths this year. Dallas County, where the mayor declared a health emergency last week, accounts for 270 cases and at least 11 deaths. Ohio. The Disaster President has declared a major disaster exists in the State of Ohio in the area affected by severe storms and straight-line winds during the period of June 29 to July 2, 2012. The worst affected areas are in the counties of Adams, Allen, Athens, Auglaize, Belmont, Champaign, Clark, Coshocton, Fairfield, Franklin, Gallia, Guernsey, Hancock, Hardin, Harrison, Highland, Hocking, Jackson, Knox, Lawrence, Licking, Logan, Meigs, Miami, Monroe, Morgan, Morrow, Muskingum, Noble, Paulding, Perry, Pickaway, Pike, Putnam, Shelby, Van Wert, and Washington. Oklahoma. The Disaster President has declared a major disaster exists in the State of Oklahoma in the area affected by the Freedom Wildfire during the period of August 3-14, 2012. California. California Governor has declared a state of emergency in 3 Northern California counties—Plumas, Shasta and Tehama—due to raging wildfires. Wildfires have destroyed dozens of homes and threaten hundreds more, forcing evacuations and road closures. Ponderosa Fire, which had already consumed about 25,000 acres, destroying more than 85 homes and other structures, was threatening the small community of Mineral, south of Lassen National Volcanic Park. The blaze has already forced about 3,500 people to flee their homes in Tehama and Shasta counties, north of Sacramento. Chips Fire in Plumas County has scorched about 100 square miles since late July and threatens more than 900 homes. Idaho. USDA has designated 34 counties in Idaho as natural disaster areas due to damages and losses caused by the combined effects of hail, excessive rain, frost and freezes that occurred from Jan. 1 – July 25, 2012. The Idaho disaster designation also includes 9 counties in 6 bordering states. United States. Drought conditions continue worsening in key farm states, with 63.20 percent of Continental U.S. experiencing Moderate to Exception Drought condition (D1 to D4 on the U.S. Drought Monitor). U.S. Drought Map – August 21, 2012. 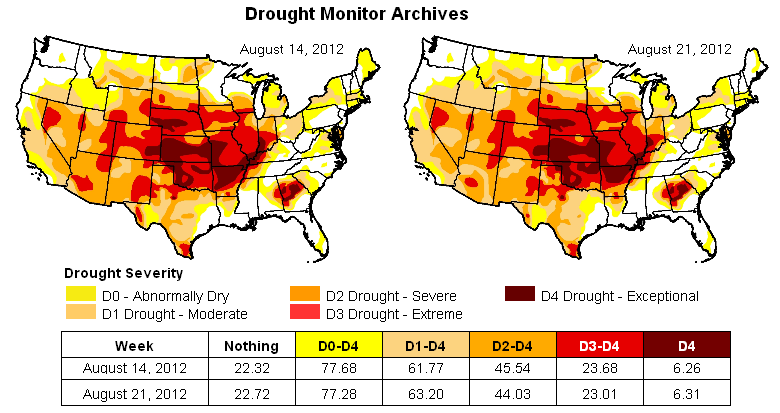 Source: US Drought Monitor.